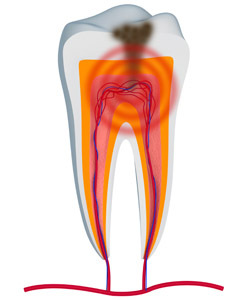 Root canal therapy is the procedure in which damaged or infected tooth nerves are removed from the tooth’s root canal. This treatment is often needed when a cavity is not addressed early on and the infection reaches the canal of the tooth root. When the infection reaches the nerve pulp of the tooth root, it can cause inflammation, swelling, and potentially a painful infection. In order to prevent this, our dentists recommend removing decay as soon as it’s detected to prevent this bacteria from getting to the nerve of the tooth. First, you need to visit our doctor and determine if root canal therapy is really what you need to resolve your toothache. If it is, the root canal treatment can start right away or an appointment can be scheduled for a later date. The root canal is carefully accessed through the tooth. This process is undertaken with great care to leave as much natural tooth structure as possible. Once the root is exposed, the nerve pulp/tissue is gently removed. The root is sterilized and fillers replace the nerve pulp. The canal is then sealed and a tooth filling completely and permanently closes the canal. You may or may not require a dental crown to complete the treatment. TOOTH PRESERVATION | You don’t get a third set of teeth. Once your adult set comes in, you’re playing for keeps. A root canal allows you to keep your natural tooth! GET RID OF PAIN | A toothache can really be debilitating. Let us help free you of the pain with our comfortable root canal therapy option. Root canal treatments aren’t something to be dreaded. If you are experiencing a toothache, please, call us or visit us as soon as you can. You don’t need to suffer. We’ll make the experience comfortable and worthwhile for you by taking away your pain and fixing your tooth.